Last month, Sri Lanka witnessed some of the worst violence in recent memory, as mobs of Sinhalese Buddhist hardliners rampaged through the streets of Ampara and Kandy attacking Muslim homes, businesses and places of worship. Over the course of several days, hundreds of buildings were vandalised and burned to the ground, and scores of individuals assaulted, threatened and forced to flee for their lives. Two individuals were killed as a result of the attacks, with many more left seriously injured. Just as troubling are those consequences of the violence that we cannot yet quantify: the trauma inflicted on those targeted, the shattered trust between communities, and the increased risk of future conflict associated with the fresh grievances that have been sown. Since the worst of the violence was reigned in on the evening of Thursday 8th March – following a slow and ham-fisted response from the authorities, which saw much emphasis placed on restricting the public’s access to the internet, and not enough on arresting perpetrators on the streets – ample column space has been dedicated to explaining the causes of the carnage. Some commentators have stressed the emboldening of militant Buddhist groups in recent months and years, facilitated by a political resurgence of an odious brand of Sinhala nationalism and widespread societal support for it. Others, for example, have highlighted the unchecked rise of Islamophobic myth-making and hate speech, particularly across social media, as well as the misogyny and toxic masculinity that appear to have animated the (almost exclusively male) perpetrators. Each of these perspectives adds something to our understanding of the recent violence. Yet what is striking among the various analyses that have been offered, is the general level of consensus about its overarching cause: impunity. To put it very simply, violence was used because the perpetrators did not fear the consequences of using it. And, for now at least, those consequences have remained minimal, just as they have in relation to past cycles of violence and mass atrocity in Sri Lanka – from the ‘Black July’ progroms and the bloody suppressions of the JVP insurrections, to the indiscriminate killing of thousands of (mostly Tamil) civilians in the final stages of the civil war and the targeted violence against Muslims throughout the post-war period, from Aluthgama to Gintota. Despite hundreds of arrests, including against former soldiers, local politicians, and the leaders of extremist organisations, no one has yet been formally charged, let alone successfully prosecuted, for the recent attacks. 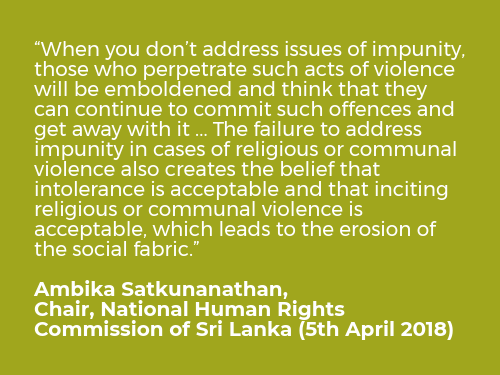 In this context, last month’s session of the UN Human Rights Council in Geneva provided a timely opportunity for both the government of Sri Lanka and members of the international community to take stock of the violence, and to signal in the strongest possible terms a commitment to addressing its major underlying cause. How did they fare? The opening of the general debate on Sri Lanka on 21st March saw the UN High Commissioner for Human Rights once again set the bar on the issue of ending impunity in Sri Lanka. 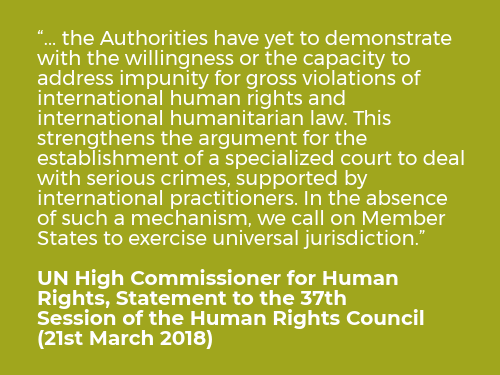 In a hard-hitting statement, which provided an overview of the government’s dismal progress in implementing Human Rights Council Resolution 30/1, the High Commissioner clearly spelled out the current regime’s failure to act on accountability, and re-stated the urgent need for the establishment of a Special Judicial Mechanism capable of bringing perpetrators of human rights violations to book. In the absence of such a mechanism, the High Commissioner said, UN member states should seek to bring perpetrators to justice themselves through the exercise of ‘Universal Jurisdiction’ – a legal doctrine which enables countries to arrest and try those who commit atrocity crimes, notwithstanding the fact that they were committed in a foreign jurisdiction. Unfortunately, the statements by UN member states on ending impunity in Sri Lanka were not as uniformly impressive. In contrast – and of concern – however, were those statements which discussed the challenges of impunity and the need for accountability merely in the abstract, or which failed to describe these challenges whatsoever. Strikingly, a joint statement by the UK mission on behalf of the four original co-sponsors of Resolution 30/1 contained no mention at all of the government of Sri Lanka’s failure to bring perpetrators of serious human rights violations to justice, nor any reminder of the pressing need to do so – either by legislating for a Special Judicial Mechanism, or by fast-tracking the so-called ‘emblematic cases’ of serious human rights violations. The growing timidity around the issue of impunity from among members of the international community, including those countries who played a pivotal role in putting it on the agenda in Geneva, is deeply concerning. Unchecked, it is a trend which could fatally undermine the already slender prospects for meaningful action on the issue over the next 12 months – the timeframe for implementation currently envisaged by Resolution 30/1, after which scrutiny via the Human Rights Council will come to an end unless a further Resolution is adopted by its members. As the Sri Lanka Campaign recently argued, this timeframe represents a narrowing window of opportunity for holding the perpetrators of serious crimes accountable. The international community’s growing unwillingness to speak up on ending impunity risks narrowing it still further – by reducing the costs of the government’s failure to take incremental steps towards the establishment a credible justice mechanism, and by emboldening those war crimes apologists currently seeking to thwart this process. Into the vacuum of silence on accountability afforded by the international community, anti-accountability voices and positions have continued to gain ground. The recent statement by the Sri Lankan Foreign Minister to the Human Rights Council – the first time that a government of Sri Lanka delegation has expressly communicated to the forum its opposition to international participation in an accountability mechanism – represents the latest high water-mark in this spiralling dynamic. There is only one end-point to such a dynamic: impunity; impunity that leads to further mass violence, further atrocity crimes, and further human lives destroyed. If we are silent about the former, then we can all expect to hear much more about the latter in the coming months and years – again and again and again. We need to talk about impunity. Many of which, it has now been well documented, involved the active participation of members of the police Special Task Force (STF). It should be noted that this debate also covered the human rights situation in six further countries: Colombia, Guatemala, Honduras, Burundi, Cyprus, and Iran. Delivered by the Deputy High Commissioner for Human Rights, Kate Gilmore. Presenting the interim findings of his October 2017 visit to Sri Lanka, the UN Special Rapporteur on Rapporteur on the promotion of truth, justice, reparations followed the High Commissioner’s statement by making some similarly tough remarks on ending impunity and highlighting the dangers of recurring atrocities. Regrettably however, his statement did not make reference to the need to establish a Special Judicial Mechanism, which the government of Sri Lanka committed to doing as part of Human Rights Council Resolution 30/1, adopted in October 2015. This includes 6 HRC members who made individual statements, as well as 6 HRC members who participated indirectly via joint statements, such as the US (in the context of the statement by the co-sponsors of Resolution 30/1, read by the UK) and the various members of the EU (in the context of Bulgaria’s statement on behalf of the bloc). This includes Bulgaria, Canada, Denmark, Ireland, the Netherlands and Norway. We exclude from this figure those 17 non-members of the HRC who participated indirectly via joint statements (including Macedonia, Montenegro and the remaining members of the EU), as well as the statement by the government of Sri Lanka. i.e. omitting any reference of the kind of accountability mechanism specified in Resolution 30/1. These include, for example, the murder of the ‘Trinco Five students,’ the assassination of Sunday Leader Editor Lasantha Wickrematunge, and the disappearance of cartoonist Prageeth Eknaligoda.